This interview was conducted via email by Interview Editor Monica Petersen. Of the process, she said, “I was super excited when George Saunders accepted my interview request because his popularity was growing every day. His responses to my questions really dive into the heart of his writing process and how he crafts each story.” In this interview, he discusses writing under constraint, his revision process, and the reflection of himself in his characters. Superstition Review: The short story “Tenth of December” from your newest collection has received a lot of acclaim, becoming a favorite of readers. When writing that particular story, did you have a feeling it would stand out? What draws readers to this particular story? 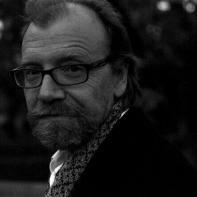 George Saunders: Well, as I was writing it I could sort of feel that it was going to be different, just by how much trouble I was having. Not bad trouble, but good trouble—I kept finding myself writing in modes I wasn’t familiar with. So, for example, there’s a scene where Eber is trying to retrieve a coat from a hole in a frozen pond, and I was noticing that it was all physical action, no humor, very little (and very telegraphic) interior monologue. I kind of felt like I was writing a thriller or something. So that’s good, when that happens: it means you’ve written yourself somewhat out of your comfort zone. I also found that in writing Eber I was channeling myself a lot more than unusual – he was just me, with some rearrangements and exaggerations. That was kind of new. And the story felt very emotionally open to me, which I liked – and I am trying to follow-up on that in what I’m working on now. SR: One of my favorite short stories is “Fox 8,” which is told from the viewpoint of a fox who learned his English from “yumans.” The story contains creative spellings and non-standard grammar. How did you craft “Fox 8”’s style? Did you enjoy breaking conventions? GS: As I remember it, I had written one humor piece that used bad spelling and another from the point of a (very articulate) dog. So the idea presented itself to combine these two. Then, once you say that bad spelling is part of the mix, the game becomes to do that in such a way that it doesn’t become too cute, or cloying—and that is very much a line-by-line struggle. I was just trying to make lines where the misspelling was part of the music of the sentence. So this ended up meaning, for example, avoiding the too-common misspellings and trying to find newish ones. I’m not sure I enjoy breaking conventions but I really like the feeling of writing under constraint. That’s a challenge. The reader might feel, you know: Ugh, a story full of misspellings, how annoying. And I can see that. So the game becomes to try and win the reader over, in spite of her initial resistance. SR: The end of “Fox 8” contains a quote that is similar to your recently talked-about Syracuse University commencement speech on regrets and kindness: “By now I know that you Yumans like your Storys to end hapy? If you want your Storys to end hapy, try being niser.” What has prompted your focus on such a deceptively simple concept? GS: I think what I’m focusing on, in the larger picture, is this: since we all know that kindness and goodness are desirable, why do we as a species have such a hard time implementing these? When we look at history, humans have often behaved really badly, while other humans (or even the same humans, in different aspects of their lives) have behaved quite lovingly and selflessly. So what’s up with that? That really interests me. SR: The title story in your collection In Persuasion Nation occurs in an alternate universe where all the characters and symbols of the commercial advertising world come to life. How did you come up with this universe? What was your experience in crafting it? GS: Actually those commercials were originally part of another story in that collection, Brad Carrigan, American (which is set in a sort of reality TV world). They were originally the commercials that interrupted the Carrigan Show. They didn’t work in that context—too much going on—but I liked them. So I kept them around and kept trying to get them to start telling a bigger story. During that period, as I remember it, I was trying to poke around the fringes of my (limited) talent—just to see what else I could do. Those two stories were my attempt to go for the comedy first, and let the humanity of the characters figure itself out later—that is, I was not doing what I would usually do, which is insist that, at every turn, my characters act like real people. Instead I just started the early drafts by writing a bunch of really manic scenes and jokes. Then later I started to look for little moments of emotional payoff and sort of grafted them in as I could. SR: “The Semplica Girl Diaries” was written over a 14-year period. How did you finally decide the story was ready to be told and published? How did the story evolve through that period? GS: Well, I got stuck at one point in the middle – just after the big happy birthday party. And I was stuck for, really, years. That first part has a nice dramatic arc and I was having trouble figuring out how to restart the story after that big emotional climax that is the party scene. I wrote many, many versions of the next movement. And kept feeling that they weren’t right. I would read through to that point, feeling pretty good—and then the energy would drop. The story had to restart at that point, and I had to know where it was going before I could figure out what the restart was—and I couldn’t figure out where it was going until I had the restart nailed down. Aiyee! Am giving myself a panic attack just thinking about it. SR: In “The Semplica-Girl Diaries,” the narrator uses a journal-style shorthand. Did you try to write this story in other styles before settling on this one? What was your process for developing this style? GS: No, I really didn’t. I just had a hunch that it would work. I’d been reading my own diary entries from when our kids were little, and was struck by how weird and telegraphic and almost poetic (goofy-poetic) they were—compressed, article-free, self-referential—but also how emotionally honest they were. Almost desperate, with love, and hope for their futures and real self-doubt about my parenting and so on. At about that same time I read this amazing book called “I Will Bear Witness,” by this German professor who lived through the Holocaust and kept a very extensive diary all the way through, never knowing that he was “in the Holocaust.” It was just his life, and was full of blind spots and weird emphases. It was often more about his hypochondria than Hitler And I thought there was something profound about that—as we live, we seldom know what big moral errors we and our culture are involved in. SR: Several of your stories take place in hyper-realistic societies. For example, in “Escape from Spiderhead,” everyone has a drug pack attached to them and in “The Semplica-Girl Diaries,” women are used as decorative lawn ornaments. How do these societies become real to you? What can these societies say that the real world cannot? GS: They become real to me through revision, which I do a lot of. As you adjust and edit your sentences, you become aware of new levels of detail, which is how a world gets made. But you are becoming aware of them via micro-attention to the sentences, plus the belief (or the enacted, feigned belief) that the characters (no matter how odd their surroundings) are basically you, on a different day—you give them that dignity. So even though there might be something weird about the world, the characters are thinking and acting in a human way, as if the weird thing doesn’t particularly surprise them. Which is, of course, what we do: even though there is something weird about our world (We’re dying! Others of us, this very moment, are suffering unspeakably!) we think and act in a human way, as if those facts don’t surprise (or daunt, or terrify) us. SR: Two of your stories in particular, “I CAN SPEAK" and “Exhortation,” are work-focused and written as a customer service letter and an office memo, respectively. How did it feel to write fiction in these business writing forms? Did you experiment with other forms in writing these pieces? GS: No, I think both started in those forms, which go under the category of “self-imposed constraint,” mentioned above. The thing is, the constraining form (whether it be an external form, like a supposed business memo or a style constraint (“Write in diary format, very few articles”), is a great way to blunder on to new truths. Your attention is on playing by the rules of the form which leaves your subconscious unsupervised, free to go into surprising and maybe even forbidden places. The assumption is that the person speaking is fully human, but is forced to emit his truths through an expression-limiting filter. (That could be a pretty good definition of poetry, actually: “An attempt to emit truth through an expression-limiting filter.”) We respond to this condition as readers because that is actually what we are trying to do, every day, in “normal” speech: trying to communicate what is ineffable and incommunicable, via an inadequate delivery system. We can feel it, but can’t say it, exactly. And that frustration – and the stresses and cracks in the resulting prose—are powerful for us as readers, somehow. GS: Well, like any art, it’s “inclusive” in the sense that, if you can do it (can write a good story), you win. That is, if you can convert your own odd, insignificant, embarrassing experiences and worldview and self into something that charms on the page, you’ve redeemed all of those things, in a sense. Nobody is too imperfect to be a writer.A successful artist is performing judo on his own fucked-up-ness. We might say that being an artist involves a willingness to accept who you are and bring it to the party. So that’s what I mean by “energetically”: just bringing with you the force of your own self-acceptance, maybe. Or maybe I just mean “having energy”—being bold and unafraid, and hoping to make something happen, whatever it is. As opposed to, say, having a slavish attitude toward your art, wherein you are trying to be safe and not offend and make sure that your work does “just what it should.” Ugh. Who needs that? that would be like being described as a “perfectly fine” lover, or heart surgeon, or Messiah. SR: In your recent appearance on The Colbert Report, you said that short stories contain a “special kind of beauty.” How do you find each piece of beauty in your short stories? Is it something that always exists or do you have to create it? GS: I think you have to work toward it and discover it. For me it works best if I don’t really know, at the outset, how a story is going to be beautiful, or even if it is. Then I just follow the trail, line-by-line (revision again!) until something starts to develop. A story has a natural energy, after a certain point—it is leading you somewhere, not vice versa. SR: In a recent chat with Paris Review, you discussed the revision process as bridging the “big gulf between all of those thousands of in-the-moment typing bursts and what I would consider ‘the literary.’” What steps do you take to build the bridge between spontaneity and the literary? Is some of the honesty from those “in-the-moment typing bursts” lost in revision? GS: It’s basically just a process of re-reading and marking-up the text, over and over, until it feels right. Ideally, no, nothing is lost—sometimes I get too severe in the cuts, but then, recognizing this, I just revert to the earlier version. It’s sort of like in a recording studio, where you can “comp” dozens of revisions so that the result is both the most spontaneous and the tightest. That’s the idea, anyway. SR: In your essay “Mr. Vonnegut in Sumatra,” you described writing as “the process of doing whatever was most unnatural.” You said this several years ago; does your process still consist of mostly “unnatural” things? Have parts of the process become more natural? SR: In an interview published in Slate, you said that the role of fiction is the “transfer of energy from writer to reader.” You also mention in your essay “Braindead Megaphone” that an author becomes a voice in the reader’s mind. How does this transference of energy take place? What’s your responsibility as a writer once you have gained the reader’s attention? GS: Honestly, I have no idea, although I expect it has something to do with empathy—the reader follows the writer (her brain follows the writer’s brain) and is thereby placed into the fictive situation, and reacts to this as she would if the situation were real. But of course, it’s a big mystery. And yet we know it happens, because we’ve experienced it. The other thing is—I’m not sure knowing how it’s done (in some sort of technical or neurological way) would help us actually do it—in the same way that a guy could understand the muscle-physics of shooting a basket, but still shoot nothing but bricks. SR: You teach creative writing at Syracuse University. When you teach your writing classes, do you find that you give advice you do not use in your own writing? GS: I try not to. And I always underscore any advice that I feel they should treat with caution. For example, I’m teaching Chekhov’s “About Love” trilogy right now, and it is so good—so many resonances and moments of cross-firing and bold narrative strategies—and we go through all of that—we look at structure and form and parallelisms and so on. But I like to remind my students (and myself) that, although these things are in the story, we don’t know how Chekhov did it. Likely not by (merely) studying someone else’s story and then “transferring” those effects. So that part has to remain hazy. We read, we note—and then, the connection from that to our own work is tricky and mysterious. GS: It’s a former tool shed about 100 feet from our house, on the edge of a forest. I rough wooden house. No internet. Lots of swearing coming from inside.